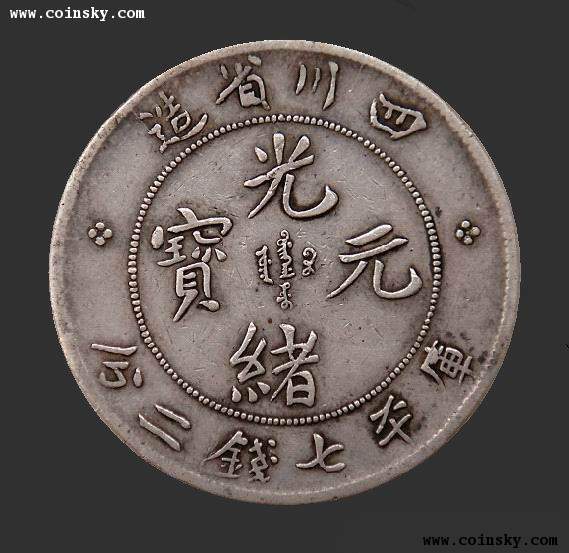 What is your chinese coin worth ? 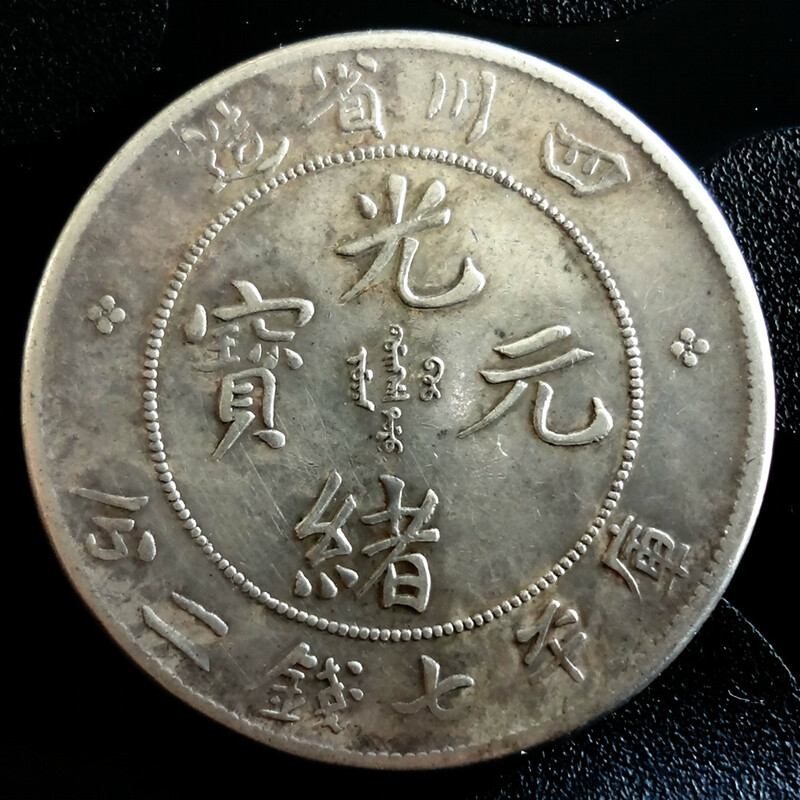 Coin appraisal – what is your chinese coin worth ? A good friend from Hangzhou recently contacted me regarding a Chinese coin he was interested in purchasing. 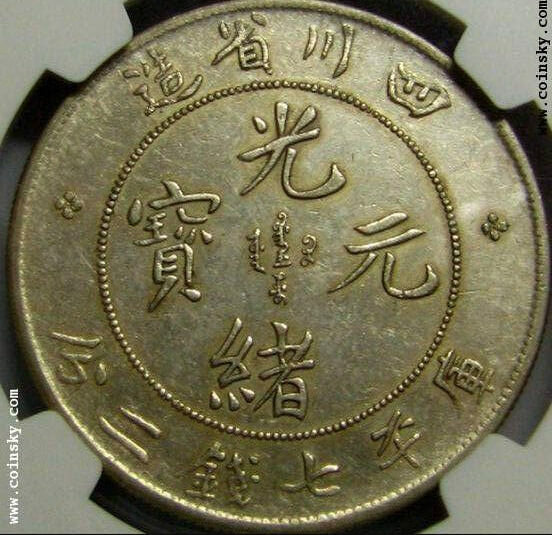 It was a beautiful but rather expensive Szechuan coin (￥100,000 RMB or about $16,400 USD at the time of writing), and he was unsure about the deal. The Szechuan dollar my friend was considering to buy was a high grade sample of the rare “库 not connected” variety (四川光绪剑毛龙无头车). It had sharp details and was graded AU50 by NGC, however the coin had clearly been cleaned and my friend hoped for a discount. I browsed past sales results when I was struck by the similitude between the coin my friend coveted and a Szechuen dollar sold at the Jiuzhou 2012 Summer Auction (九州2012夏季机制币、纸币拍卖专场). At first, I thought that the coin graded XF details by PCGS had been re-submitted to NGC in a bid for a more favorable grade, but I quickly verified that the coins’ obverse were distinct. While carefully examining the reverse, I was troubled to find an identical scratch below the right side rosette. Despite the low resolution of the pictures sent by my friend, it was obvious this ought to be a circulation mark. 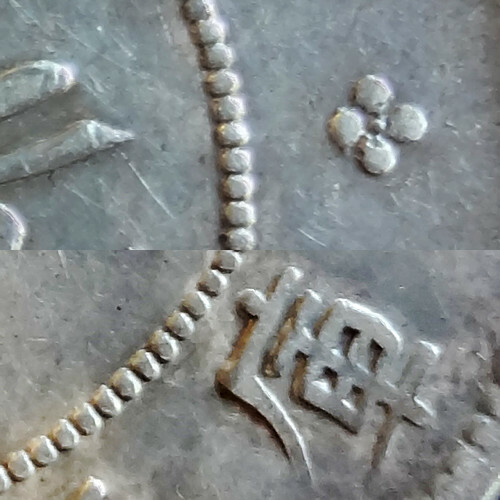 Two coins of the same type often exhibit wear or weak strike in the same place, but identical circulation marks should never be observed: it would indeed imply both coins were randomly damaged in the exact same fashion while being handled by countless men and women through a century! 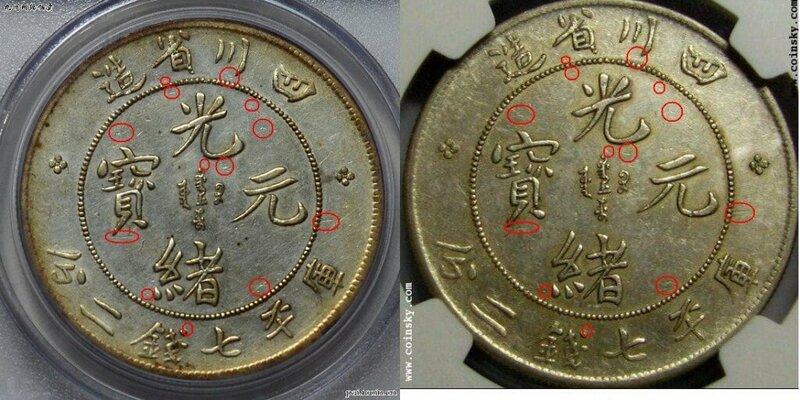 The scratches I highlighted on the picture above were damning evidences that both coins were very high level forgeries. The counterfeiters went to the trouble of striking different obverses, but were surprisingly lazy etching the same marks on the reverse. 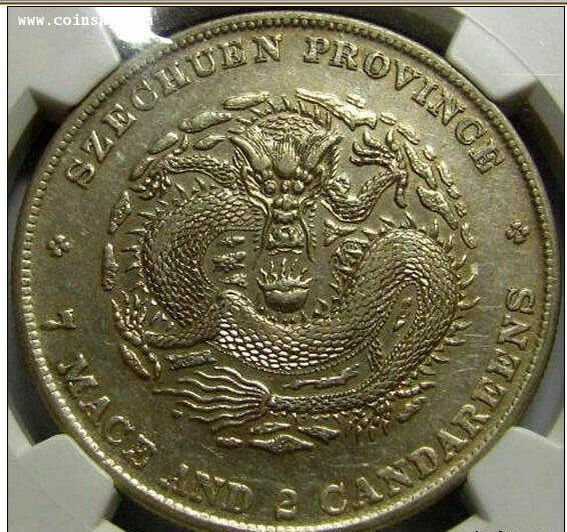 The replica is still stunning, and actually fooled two world-class grading agencies and the highly experienced Chinese coins collectors who bought them. It is especially troubling that without the inexplicable laziness of the counterfeiters, and a stroke of luck comparing pictures on the Internet, both fake coins would have most likely stayed undetected. Once again, I will urge my dear readers to listen to their instinct when buying: if you are somehow hesitant about a deal, like my friend was, the best decision is often to walk away. It is also best to avoid buying cleaned or polished coins altogether, especially in high grade, as it is too convenient a camouflage for artificial aging. Navigating the more than 200 known varieties of the Szechuan dollar can be intimidating; the erudition required makes the Szechuen 7 mace and 2 candareens the darling of sophisticated Chinese coins collectors. As the number of advanced collectors increase and knowledge about the rarest varieties becomes more widespread, their value have dramatically increased in the past two years and Szechuan dollars in desirable condition have already all but vanished from the market. 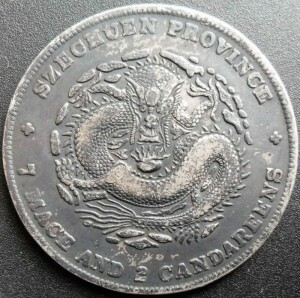 The Szechuan Narrow Face Dragon, with a doubled die error on the obverse (see below), is one of the hottest varieties. I had mentionned in an earlier post that this type had even rarer subvarieties, one of which I recently acquired an interesting specimen graded by PCGS. At first glance, both coins look very similar. 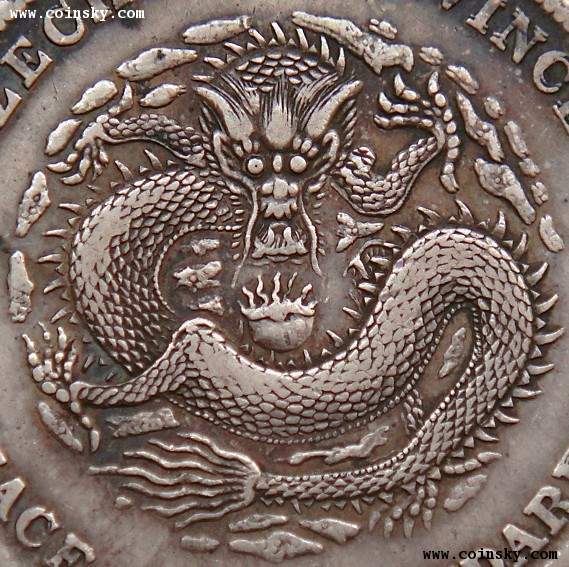 The gaunt dragon has the same ragged one-eyed face that makes its charm, the doubling on the English legend characteristic of this type is still there as well. 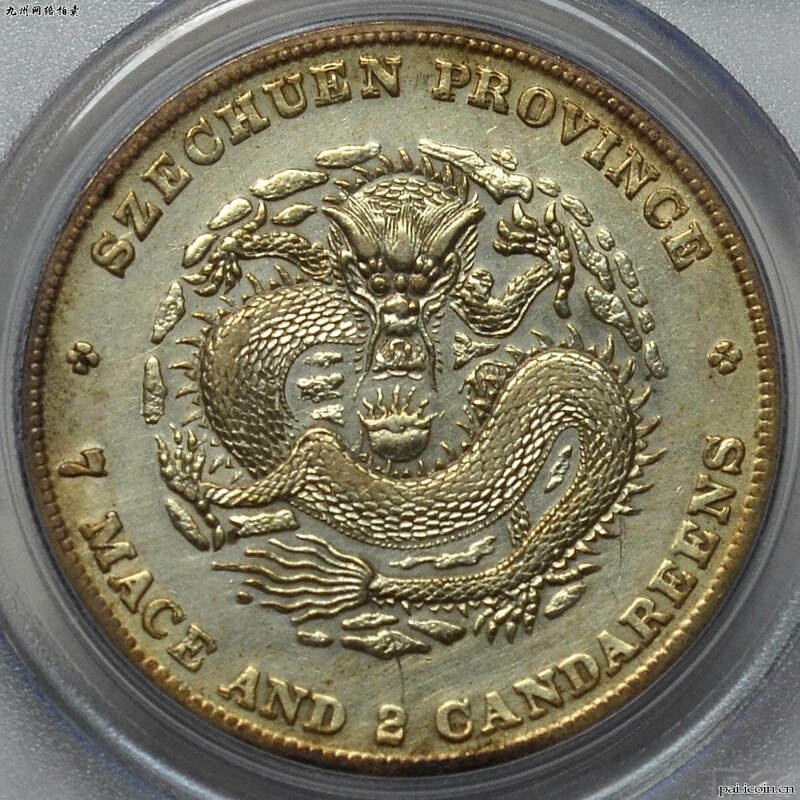 The difference is indeed on the reverse side of the coin (see below). 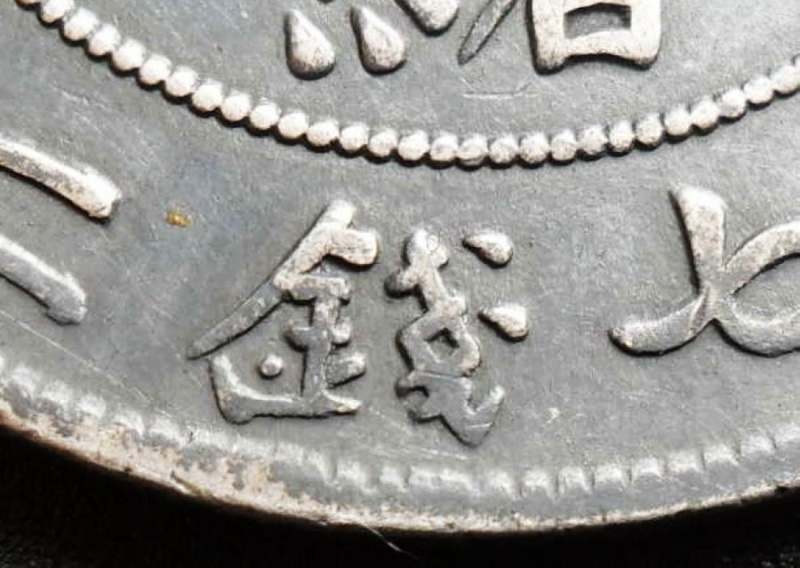 The attentive reader will notice that the top the “庫” character on the reverse is very different, as if the brush of the calligrapher let out an ink blot drawing it. 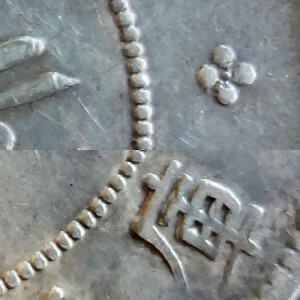 The bottom “省” character is also maculated with a similar silver ink blotch. The full name of this very rare variety is 剑毛龙无头车花心点粘笔庫, or literally “Sharp spines dragon with decapitated Chē, rosette with dot, and smudged Kù” in English; what a nice demonstration of the compactness and expressivity of the Chinese language! The image of a gauche scribe making ink blots is more romantic than the hard, mechanical reality: this kind of filling is called a “die chip” error. Damage to a small portion of the die or weakness in its design can lead to raised, unstruck surfaces, which often manifest as plugged letters or dates. 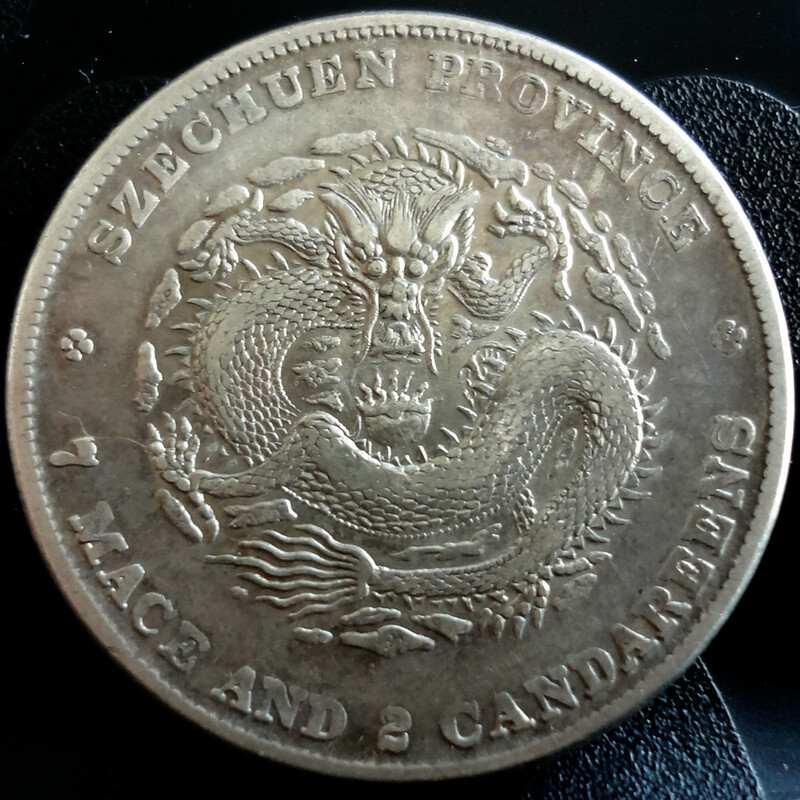 A more concise English name for this variety could therefore be “Narrow face dragon with doubled die on the obverse and die chip on the reverse”. Two weeks ago, I had the pleasure to travel back to the Szechuan province to pay an overdue visit to an old friend. Between enjoying the wonderful food in Nanchong and sipping tea by the Jialing river in Langzhong, I asked my friend to show me the antique market where the year before she had impulsively bought a lot of sixty fake coins. It was an excellent excuse for a stroll and I was curious to see if there would be anything genuine there. After walking through the crowded streets of the old Nanchong, we reached the market and went from shop to shop. There was indeed nothing of value, and I was ready to leave when a seller in a 旮旮旯旯 (pronounced kakagogo’r) corner of the market told me that he could show me interesting Chinese coins if I came back tomorrow. The seller kept his word and indeed presented me genuine coins the next day. One of them caught my attention: it was one of the famous Szechuan three musketeers (四川三剑客). 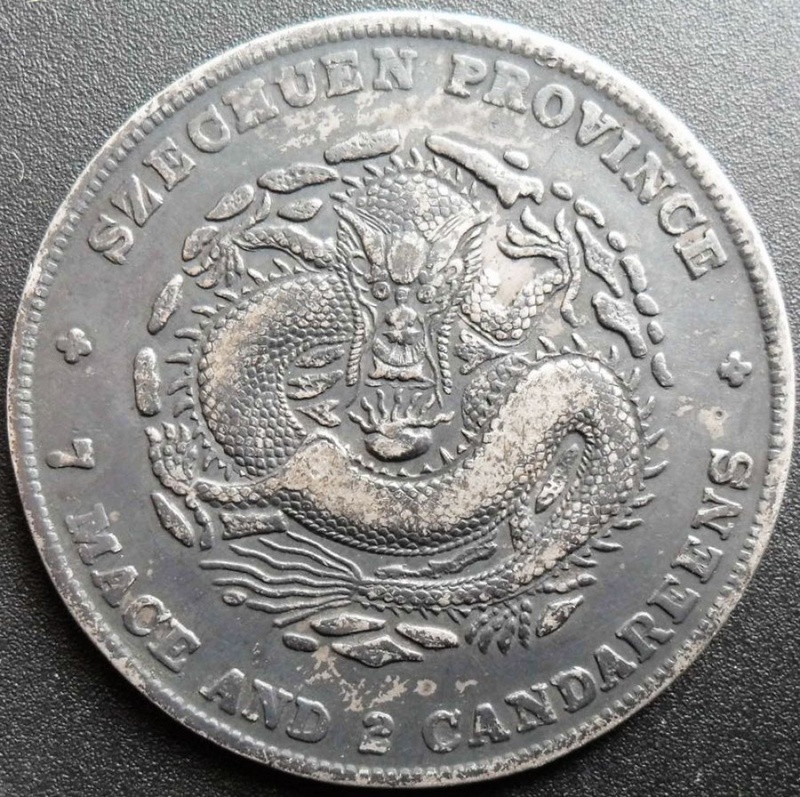 The Sān jiàn kè is a trio of rare and famous varieties of the Szechuan dollar, particularly coveted by Chinese coin collectors. These varieties are very difficult to find in good shape, some having been struck with badly duplicated dies, like the one I just found. 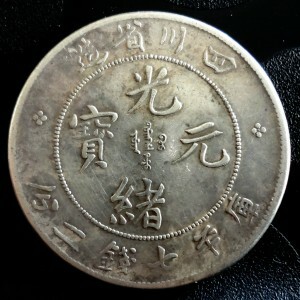 The coin I had in front of me was a 剑毛龙 (sharp spines dragon), with a misshapen 庫 character on the reverse: the top of the vertical stroke of 車, which normally should connect to the 广, was missing. The full name of this rare variety: “Sharp Spines Dragon, with a decapitated Chē and a rosette with dot” (剑毛龙无头车（花心带点）) sounds like a dish from a French restaurant menu but it is necessary to precisely identify this particular type amongst more than two hundred recensed varieties of the Szechuan dollar. 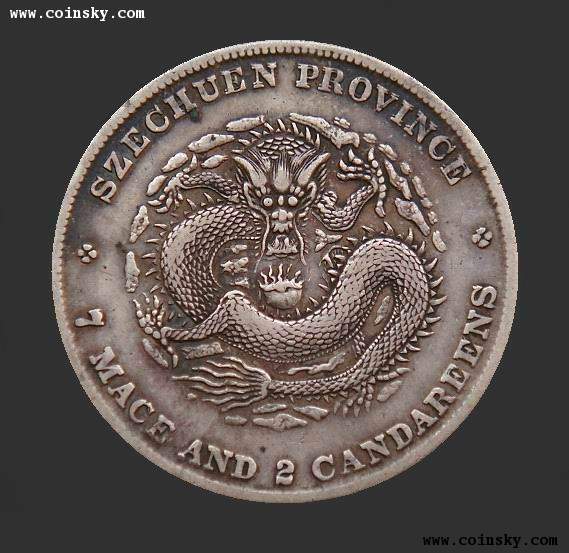 The coin I got in Nanchong is only second in rarity to the 7 mace and 3 candareens Szechuan dollar. That error coin is very hard to obtain in good condition, with most specimen available only in VF grade or less. 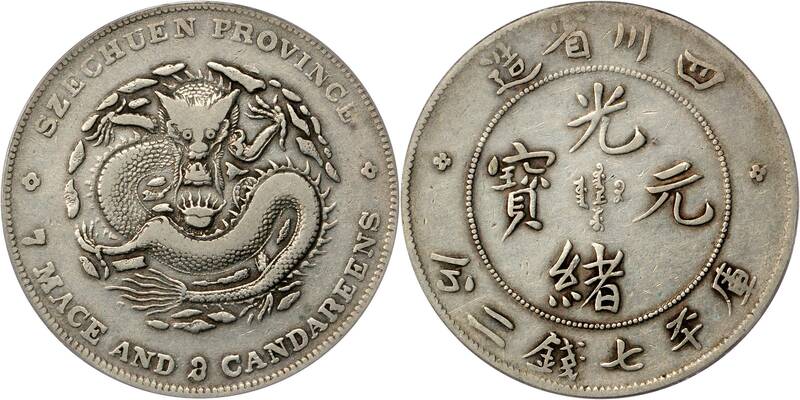 The Chinese name of the variety is 尖角龙七三误书, or Pointed Horns Dragon with 7.3 lettering error. Despite its stated weight of 7 mace and 3 candareens in English on the obverse, the coin has a Chinese face value of 7 mace and 2 candareens, and a regular size and weight, contrary to the early Kwang-Tung dollar of same denomination that actually had a higher silver content. 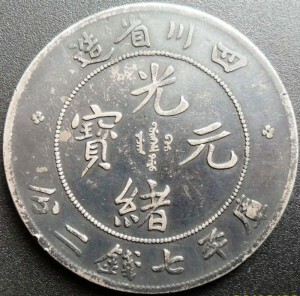 This rare error coin is affectuously called 三剑客老大 by Szechuan dollar collectors: the beloved elder of the Szechuan three Musketeers. I guess this rare and fierce dragon could be compared to Athos, the stern fatherly figure which is also the last to make its appearance in the book. The third musketeer is conversely the easiest to find of the trio. Called 大折金珍珠龙 in Chinese, or Pearl-scaled dragon with Crooked Gold, its particularity resides in the bold bottom stroke of the 金 part of the character 錢, which features an extravagant hook. 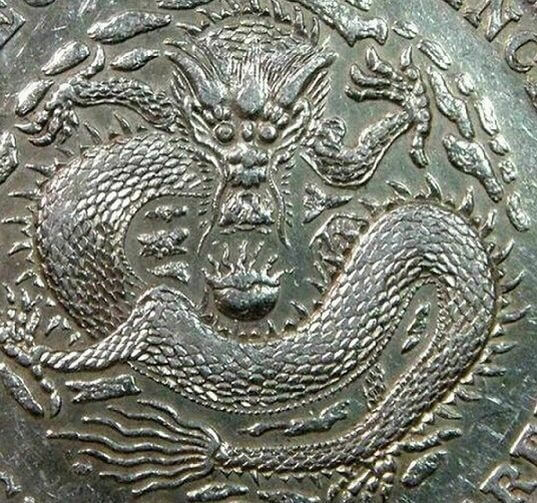 The Pearl-scaled dragon is one of the most beautiful varieties of the Szechuan dollar: most collectors will only seek it in higher grade, with all its scales still visible (全龙鳞), rejecting lesser condition coins (somewhat harshly called 垃圾龙, dragon-trash). Porthos, the elegant musketeer from Dumas’ epic, would likely have most fancied this last variety.